Gus Green, who built the XLCR in 1903 at Iluka, was a leader in purpose-built offshore trawler design. Gus was a perfectionist and the XLCR, when launched, was a fine example of his craftsmanship. The vessel was built for Bill Paddon, who pioneered offshore fishing from Tweed Heads to Moruya, establishing techniques still in use today. 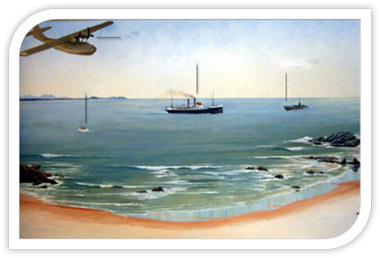 In 1926, when the XLCR was purchased by Tom Radley, Francis Cochet and Jack Woodcock and was brought to Port Macquarie, there was not an inkling of what the vessel would later contribute to the history of Port Macquarie. The highly respected Radley family was quick to make XLCR available for community work including the popular Easter regattas, surf club carnivals, and river and offshore rescue missions, whilst at the same time, continuing to revolutionise the fishing industry in our offshore waters. The Radleys were pioneers in trap fishing methods, harvesting lobsters, snapper and leatherjackets. In fact, their fishing bounty became quite legendary. XLCR can be regarded as Port Macquarie's first offshore fishing charter vessel. Volunteers were invited to fish off the XLCR with the catch being shared rather than money changing hands. As the XLCR was ketch rigged and under sail in her early days, for many it was an introduction to offshore sailing. In fact, Father Leo Donnelly had his first sea experience on the XLCR as a schoolboy in 1942. The vessel became the region's first sea rescue boat on 29th April 1943. XLCR rose to national prominence. When Skipper Claude Radley and his brave crew, knowing that a Japanese submarine was still in the area after sinking the north coast steamer Wollongbar II off Crescent Head with the loss of 32 lives, headed to sea after a Catalina seaplane alerted the authorities. 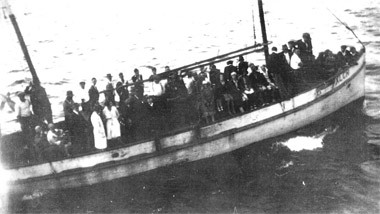 The 5 survivors were found in a half submerged lifeboat. When the XLCR left Port Macquarie for the rich fishing grounds off Eastern Victoria in 1967, her tradition of striving for excellence was to attract several new owners. She fished out of Portland, Victoria deep into Bass Straight, where she proved to be a fine sea-going vessel. She retired from commercial fishing in the mid 1990's. When the opportunity arose to bring the vessel back home, local maritime historian, Mr Bruce Jordan, appealed to businessmen David Morton and Geoff Gillespie for financial assistance. Funds were raised, and a purchase price was agreed upon. The vessel was returned to Port Macquarie by road transport in 1997. The XLCR was back on her mooring at the Historic Regatta Ground on the Hastings River requiring major restoration work and ongoing maintenance. She was sitting idle. Bruce Jordan, manager of the XLCR, witnessed the growth in the Maritime and Marine programs offered at the then St Josephs Vocational College and decided a new vocation for this vessel would ensure her future. 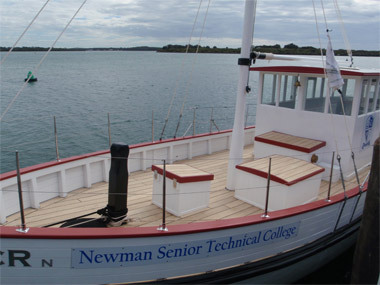 He offered the vessel to the College, (now known as Newman Senior Technical College) to restore and maintain as a training vessel and floating classroom, providing valuable experience in boat handling, navigation, ship's maintenance and engineering for generations of students into the future. The College accepted the gift of the XLCR and she was lifted from the water in early December 2004 in order to assess the extent of the necessary restoration work and stabilise further deterioration. An approach was made to Mr Arthur "Sandy" Wilkinson to coordinate the restoration. Sandy volunteered his considerable expertise to be Project Manager and develop a works program. Sandy gathered a team of dedicated volunteers who, together with the College's trade students, initially conducted major works on the hull and deck structure. Initial funding came from Mid Coast Youth Career Services in 2005. A grant from the Federal Government's Department of Infrastructure, Transport, Regional Development and Local Government ensured the work could continue, along with donations of materials from several companies. Sandy Wilkinson, his fellow volunteers and the College's trade students completed the refit in 4 years and 8 months. During the time the old Gardner engine was rebuilt and a new wheelhouse took shape. The entire hull was recaulked and a new White Beech deck was laid. Newman Senior Technical College and St Agnes Parish, Port Macquarie, provided the necessary funds to complete the work resulting in the XLCR being lifted back into the Hastings River on the 24th August 2009. And, as they say, the rest is history. XLCR now has a new lease on life and the maritime history books of the region are about to have a new chapter written. Typically, vessels in such good order, built at the turn of the last century, inevitably become painted and polished museum pieces. The XLCR will, however, continue to enjoy a working life. Her traps and nets have been replaced by students and trainees all "striving for excellence" in an exciting new era in education.